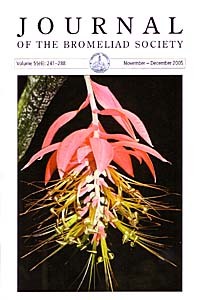 The Journal, ISSN 0090-8738, is published four times a year at Orlando, Florida by the Bromeliad Society International. Articles and photographs are earnestly solicited. Closing date is 60 days before month of issue. Permission is granted to reprint articles in the Journal, in whole or in part, when credit is given to the author and to the Bromeliad Society International. Editorial Advisory Board: David H. Benzing, Gregory K. Brown, Eric Gouda, Jason Grant, Elton M.C. Leme, Walter Till. Submitting Journal Material: Check the notes on submission of articles and other Journal material. Membership: Subscription price (in U.S. $) is included in the 12-month membership dues. Please address all membership and subscription correspondence to Membership Secretary Peter Ball, p/a 2515 County Road 369, Cullman, Alabama 35057, USA E-mail: membership@bsi.org. View the Application for Membership for more information and to join. Advertising: Advertising space in the Journal of the Bromeliad Society is available at the following rates. Rates are for Black and white only. Cost for color ad furnished upon request. All advertising prepaid. Advertisers should provide any art work desired. Advertising is presented as a service to our membership and does not necessarily imply endorsement of the product. Please address all advertising enquries to the Assistant Editor at assistanteditor@bsi.org. All advertising is prepaid. Advertisers to provide any art work desired. Back issues: The back issues of all volumes are available, also for non members, except the last 5 volumes that are in the members section only. The first volumes are not in PDF format, but the later are. Probably the older volumes will be available in PDF format later on. Click here for the archives.